AutonomeForme is invited at the public meeting “Dal caso Saline Joniche ad una città metropolitana sostenibile” (From the case of Saline Joniche to a sustainable metropolitan city) to presents the first and second step of its project for the “Natural and Anthropic in Saline Joniche”. 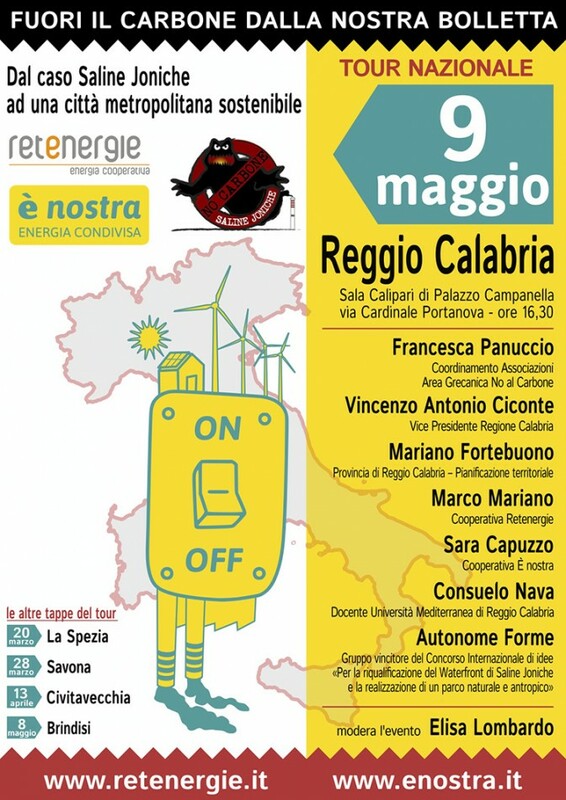 This public meeting is organized by the Coordinamento Associazioni Area Grecanica (Coordination of Associations Area Grecanica) at the end of the national tour of Retenergie and will be an opportunity to talk about the sustainable future of Saline Joniche without the wrong project of the Coal Plant. The meeting will be on May 9 in the Sala Calipari at the Palazzo della Regione Calabria in Reggio Calabria.